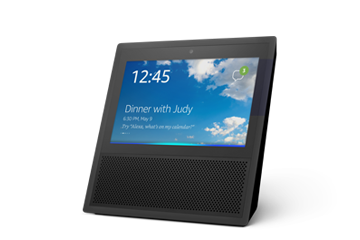 Echo Show brings you everything you love about Alexa but now, she can show you things. 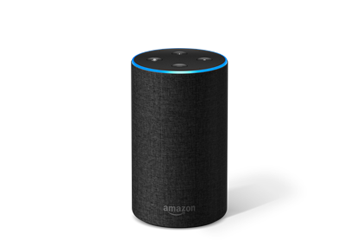 Watch video flash briefings, Amazon Video content, see music lyrics, security camera footage, photos, weather forecasts, to-do and shopping lists, browse and listen to Audible audiobooks, and more. All hands-free—just ask. With eight microphones, beam-forming technology, and noise cancellation, Echo Show hears you from any direction—even while music is playing. 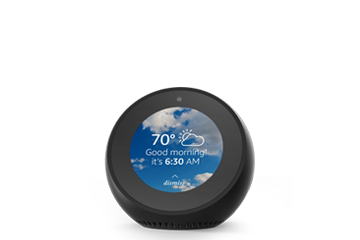 Alexa—the brain behind Echo Show—is built in the cloud, so she is always getting smarter. The more you use Echo Show, the more it adapts to your speech patterns, vocabulary, and personal preferences. And because Echo Show is always connected, updates are delivered automatically. Use Echo Show to see a live camera feed from the nursery or your front door with Amazon Cloud Cam. Turn on the fan or dim the lights from the couch—all without lifting a finger. 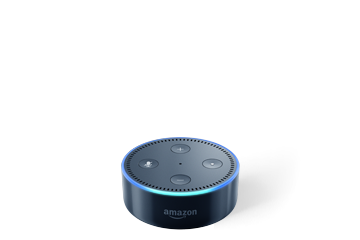 Control multiple devices at scheduled times or with a single voice command, like locking the doors and turning off the lights when you go to bed.